Substituting ground turkey for ground beef in burgers, tacos, spaghetti sauce, meatloaf and other recipes can reduce the saturated fat and cholesterol in your meals. Low in calories and high in protein, ground turkey contributes to your daily requirements for B-complex vitamins and selenium. To reduce the fat content in ground turkey, choose varieties that are fat-free or that contain no more than 10 percent fat. A 4-oz. serving of raw, fat-free ground turkey has 127 calories, 2.21 grams of fat, 62 milligrams of cholesterol and 27 grams of protein. Vitamins and minerals in this serving include 11 milligrams of niacin, 1 milligram of vitamin B-6 and 257 milligrams of phosphorous. According to the USDA's Food Safety and Inspection Service, meat sold as "ground turkey" must consist of muscle cuts without any added fat, other than the fat that occurs naturally in the attached skin. One 4-ounce grilled, fat-free turkey burger provides roughly 48 percent of the daily value of protein, or the amount you need to consume each day for healthy body function. Protein provides the structural material for your cells, tissues, organs and fluid compounds, such as hormones and enzymes. This turkey burger provides 50 percent of your daily value of niacin, a B-complex vitamin that promotes healthy blood circulation, facilitates glucose metabolism and helps control your cholesterol levels. Vitamin B-6, another nutrient in ground turkey, contributes to healthy nerve function and offers protection against heart disease. Ground turkey is also rich in selenium, a trace mineral that supports immunity, controls thyroid function and protects your body against the cellular damage that can lead to cancer or other chronic diseases. If you're trying to cut back on red meat to reduce the calories, saturated fat and cholesterol in your diet, replacing ground beef with fat-free ground turkey in your recipes can help you meet your goals. A 4-ounce serving of ground beef consisting of 95 percent lean meat has 155 calories, compared to the 127 calories in the same amount of fat-free ground turkey. This serving of ground beef has more than twice as much fat -- 5.65 grams of fat in a serving of ground beef versus 2 grams in ground turkey. Both beef and turkey contain cholesterol, but 4-ounces of lean ground beef has 70 milligrams, as opposed to 62 milligrams in turkey. The American Heart Association advises that you limit the saturated fats in ground turkey and other animal-based foods to 7 percent of your daily calories and have no more than 300 milligrams of cholesterol per day to prevent high blood cholesterol and heart disease. The fat in a 4-ounce turkey burger represents 1 percent of your daily calories if you are following a 1,800-calorie diet. The cholesterol in a ground turkey burger represents 18 percent of your recommended daily cholesterol intake. 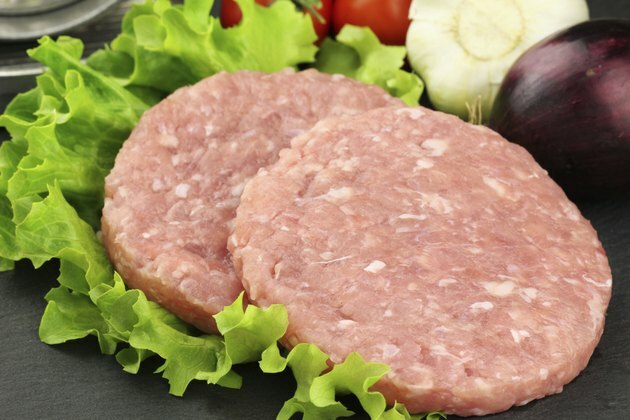 To prevent food poisoning from bacteria such as Salmonella, cook burgers or meatloaf made with ground turkey thoroughly to a temperature of 165 degrees F, advises the USDA. Refrigerate uncooked ground turkey at 40 degrees F or colder and store for no more than two days. Keep cooked ground turkey refrigerated and store for no more than four days. After preparing recipes with raw ground turkey, wash your hands, utensils, countertops and cutting boards thoroughly to remove bacteria. EatRight.org: What Does "Percent Daily Value" on Food Labels Mean?